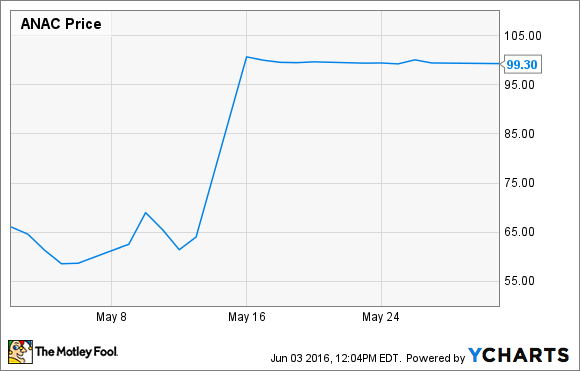 Here's what made the purveyor of novel ointments' share price skyrocket last month. What: Shares of Anacor Pharmaceuticals, Inc. (UNKNOWN:ANAC.DL), a biopharmaceutical company discovering, developing, and commercializing novel small-molecule therapeutics, shot up 58.3% last month, according to data from S&P Global Market Intelligence. Pharma's grand acquisitor, Pfizer (NYSE:PFE) made an offer Anacor's board couldn't refuse. So what: Well, it wasn't a Godfather-esque proposition, but the $99.25 per share Pfizer offered for each share of this purveyor of toenail fungus ointment was far too generous for any sensible board member to turn down. The company hasn't produced an annual profit since Valeant Pharmaceuticals shelled out $142.5 million to settle an intellectual property dispute in 2013. Almost two years following Kerydin's approval for treatment of toenail fungus, its launch has been disappointing to say the least. In the first quarter of this year, Anacor recorded the minimum gross profit possible under its distribution deal with Novartis, just $13 million. This hardly covered Anacor's expenses, and the company reported a $16.1 million loss. Now what: While its toenail fungus ointment has no legs and probably won't bring the company to profitability, an application submitted to the FDA in March seeking approval for a novel eczema ointment just might have. The trouble is, Anacor took on $287.5 million in convertible notes -- a form of debt that can be converted to shares of stock -- due about seven years from now. Without Pfizer's intervention, Anacor could have faced serious solvency issues if ointment number two, crisaborole, failed to win approval, or performed as poorly in the market as Kerydin. But luckily, Pfizer swept in to the rescue. As a Pfizer shareholder, I wouldn't be too thrilled about the $5.2 billion dollar cash offer, especially given the company's less than perfect record of making accretive acquisitions. Management believes crisaborole has peak annual sales potential of at least $2 billion. The giant's global sales force should be capable of maximizing the drug's potential, although that estimate seems awfully high. At least Pfizer refrained from mentioning "anticipated synergies" to justify the splurge. Is Pfizer's Buyout of Anacor Pharmaceuticals Enough to Move the Needle?